How do you know if you have been hit? Generally you will feel and/or hear the BB hit you. If it is on bare skin you will feel a quick sting. This is lessened by clothing or tactical gear. The sound of a BB hitting tactical gear is quite distinctive. In some cases, if the BB were to hit a well padded area in the thick of a noisy firefight it may not be heard or felt. this is where it is up to the players to be extra honest or vigilant. If you think you may have been hit, call it. If you see another player clearly hit, call it. Are Airsoft guns considered Firearms? My kids discount store guns isn’t a fireame, is it? Can I own or buy an Airsoft gun? 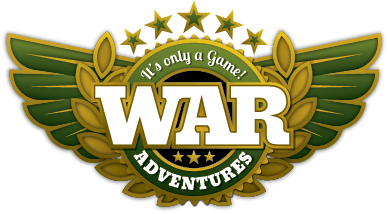 WAR Adventures offers fast moving military simulation games using Airsoft Guns and various combat scenarios. The WAR Adventures field is also available for Paintball, Birthday, Corporate and Social Club events.